Who says you can’t fish in the fall? 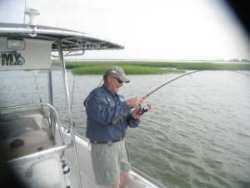 Bob is back in Charleston, South Carolina for a little fall trout fishing. Bob is joined by Robert Olsen from Knot at Work fishing charters. Deux Cheneaux Plantation is located in the heart of South Carolina’s ACE Basin. The track of land has been renowned for its abundance of game since the time of the King’s Grant in the early 1700’s. The incredible natural beauty will open a world of wildlife exclusively for you. Deux Cheneaux’s strength lies in its historic appeal, southern flavor, natural beauty and convenient location. This entry was posted in Episode and tagged bob redfern, charleston, fishing, trout fishing on 12/04/2009 by BROM. This week Bob is down at the Isle of Palms, located 10 miles south of Charleston, South Carolina. Todd Stamps with myfish.com joins Bob as they fish for Bonnethead sharks on light tackle. And don’t miss the Sportsman’s Table where Jason is cooking up a venison back strap. Sit back, tune in and enjoy the ride! This entry was posted in Episode and tagged bob redfern, bonnethead shark, charleston, isle of palms, sharks on 09/13/2009 by BROM.